Luxary bus hire in ajmer For any family Function, Marrige party or for Vacations is now made Online through our Company. We are Leading Tour operators in ajmer Engaged in Providing Transport and Complete tour Packages from Over a Decade of Time. Ajmer city has a Population of Approx 01 Million people and Has a lot of Popularity Due to it’s Dargah sharif Shrine and Pushkar town. There are small and Big Towns Surrounding ajmer Which makes it the Second largest District in Rajasthan after ajmer. Western Railway Headquarter and Rajasthan Education Board Office in Ajmer are the Jewels Of the Crown City ajmer. There are many Central And State government Offices Located in Ajmer. Which makes it a City Where more then 60% Employyes are Working in Different Departments. 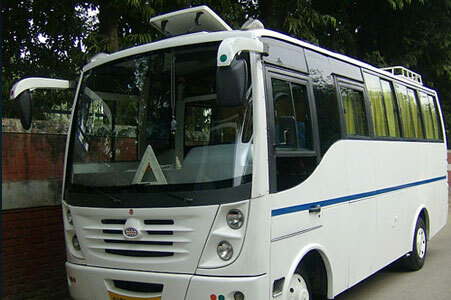 During the High Wdding season From October to April Which is Also the tourist Season of Rajasthan There is a lot of Need of Bus hire in ajmer for Wedding purpose. Our Company has Both Online and Offline Methods of Bus booking in ajmer for Family tours or other events. We Have Number of Gud Coaches Which starts from 15 Seater Mini Coach and Upto 52 Seater Non Ac coaches. Our Large Fleet contains many 21 Seater, 27 Seater , 35 Seater in Ac modules and More over 41 Seater, 45 Seater and 52 Seater in Non Ac Module. Our Buses are Comfortable and New and Drivers are Well expericed to Drive Anywhere in India. Our Bus fleet is Ready anytime for Group tours or Family Vacations. We also Undertake Corporate Enquiries and Confrence bookings in ajmer. Bus booking for pick up Drops in Ajmer and Around and Special drops to Jaipur Station and airport Service is Now Just a Call or Email away. Our Online support will always help you to To get best value for your Money and Comfort. We also provide facility of Makes small or Big Changes in Your Existing Bookings During or Before Arrival to your Tour. Our Cancellation Policies are Very Client friendly and Very Clear.